Now that we’ve feasted through our holidays and before we come to winter’s mindful fast, it’s bitter cold outside and time for comfort food. Macaroni and cheese tops many American lists in the comfort category and children scramble for the tasteless Kraft Dinner. We are all familiar with the macaroni version, but the English/Irish favorite, Cauliflower Cheese, might just be a new winter treat. Here cauliflower florets bake under a blanket of rich cheddar sauce until bubbling and browned. Piping hot, tender cauliflower lightly coated with well seasoned sauce will transport you to the wild and windswept green countryside with supper beside a glowing turf fire. Here’s a way to encourage more vegetables and substituting cauliflower for the pasta makes a lighter dish for sure. Traditionally aged white cheddar is recommended, but any assortment of cheeses you prefer may be substituted. In fact this here’s a place to use up bits from holiday party cheeses as long as the flavors blend. I’ve sometimes included the creamy insides of Brie or Camembert, crumbles of Roquefort or Stilton, Gruyere or other Swiss. If possible keep some cheddar in the base, and add what you have. A blue cheese will leave a bit of a gray streak, but will still taste delicious. My standard cooking cheddar is Cabot Vermont Cheddar. A cheese sauce can be bland and welcomes dry mustard, cayenne, nutmeg and white or black pepper. Now’s the season for Cauliflower and other Brassicas. Cauliflower, believe it or not, is high in Vitamin C and has moderate amounts of other beneficial minerals. A bubbling dish of Cauliflower Cheese will make a welcome meatless Monday supper. Served alongside a crisp green salad and a crunchy baguette or a sourdough loaf, this winter comfort food will warm you all. Cook the cauliflower in a large pot of boiling, salted water 3-5 minutes or until just fork tender. Drain in a colander and spread out to cool. 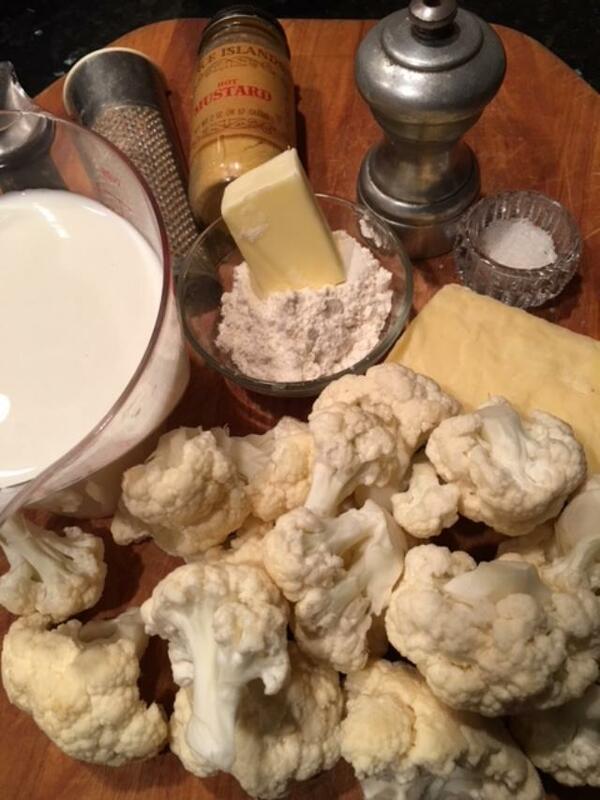 Arrange cauliflower in buttered shallow baking dish, a pie plate works nicely. Warm the milk in a small saucepan or microwave. Melt butter in a medium saucepan, stir in flour and cook a few seconds to remove floury taste. 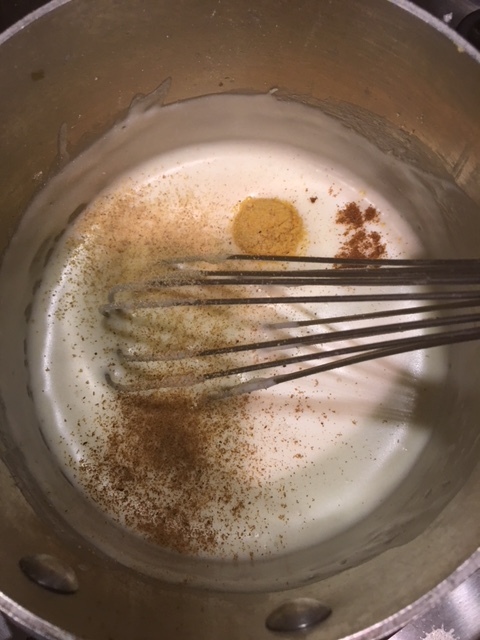 Gradually whisk in the hot milk and continue to stir until the mixture boils into a thick, smooth, satiny white sauce. Season with salt, dry mustard powder, cayenne, nutmeg and white pepper. Taste for seasonings; it should be nicely zippy at this point. Fold in 3/4ths of the grated cheese into the sauce. Stir to melt and spread the thick sauce evenly over the mound of cauliflower. Sprinkle on the remaining cheese and dust with bread crumbs. 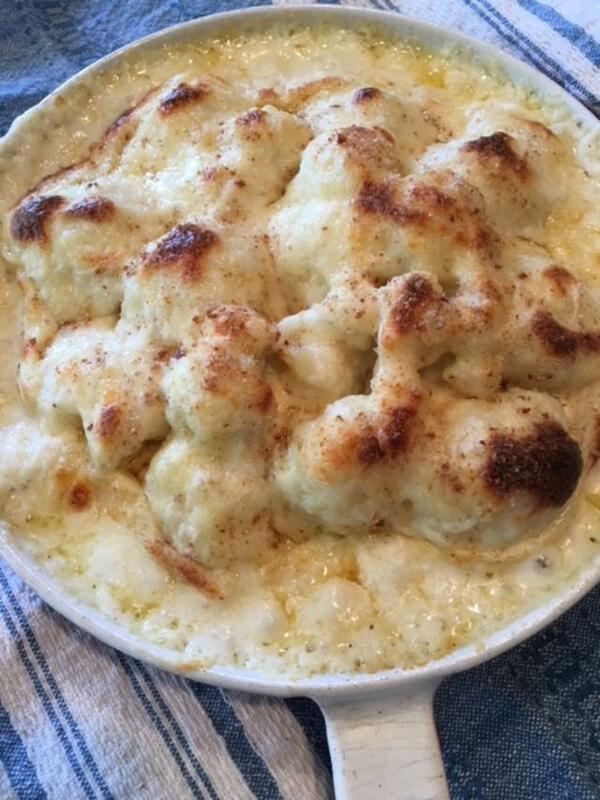 Bake the Cauliflower Cheese for 20 minutes on an uppermost oven rack. You may top brown the last few seconds if desired. Serves 3 as a generous main dish or 6 as a side. You are currently browsing the Mary Jo's Kitchen blog archives for January, 2018.